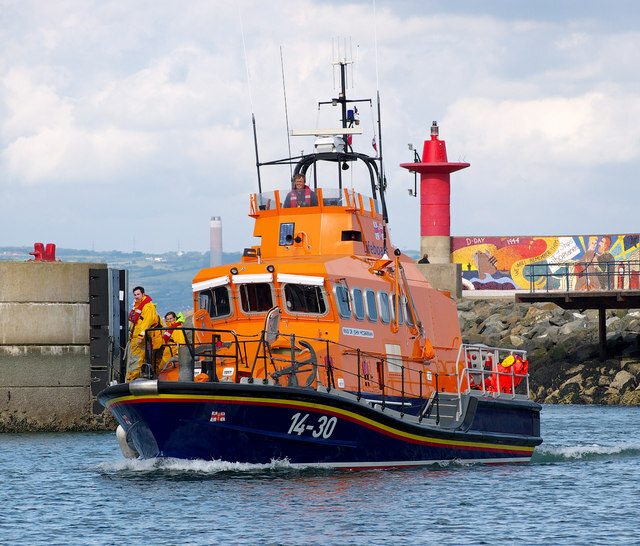 Current Larne Lifeboat Link 'Dr John McSparran' arrives at Bangor harbour during Exercise Diamond. The various vessels involved in the exercise landed 'casualties' to Bangor throughout the exercise. "Exercise Diamond, the largest maritime exercise ever held in Northern Ireland, has taken place today within Belfast Lough. The exercise has tested the response by those involved in maritime search, rescue and recovery to a major maritime incident. There had been a collision, caused by an electrical fault, between the passenger vessel, MV 'Lough Explorer' which had 120 people on board and a commercial roll on roll off ferry (the 'Stena Precision'), which had 50 passengers and 23 crew on board. The collision had caused damage to the bow of the Lough Explorer and the hull of the ferry. The Lough Explorer was sinking rapidly and the master of the ship had broadcast a mayday message and given the order to abandon the vessel. The master of the ferry reported that he could see life-rafts from the Lough Explorer and people in the water. His own vessel had begun to list and three trailers on the deck had rolled over, trapping two people. Another trailer had caught fire. The master had requested help with fire fighting, to free the trapped people and to evacuate 50 people from the vessel. A major incident had been declared. The lifeboats searched for the 100 people (simulated by numbered oranges and dummies) who were in the water following the sinking of the Lough Explorer. Twenty people (played by RNLI crew and MOD personnel) were in life-rafts and were recovered from the water by the lifeboats. By the end of the exercise 115 people (91 oranges, four dummies and all of the personnel) had been landed ashore at Bangor. Coastguard rescue officers, Police Service of Northern Ireland (PSNI) and ambulance personnel then brought them ashore before they were transported to a casualty reception centre, which was set up at Bangor Leisure Centre by North Down Borough Council, Southeastern Health Trust and PSNI. The rescue helicopters evacuated 30 people from the ship and airlifted them to a landing site at Newtownards airfield. They were met there by the Coastguard Rescue Officers, who took them to the Casualty Reception Centre which had been set up at Londonderry Park by Ards Borough Council, Southeastern Health Trust and PSNI. The helicopters also airlifted specialist rescue teams from the Northern Ireland Fire and Rescue Service and Northern Ireland Ambulance Service to the ferry, to assist with the emergency on board. HM Coastguard / Maritime and Coastguard Agency; Royal National Lifeboat Institution; Police Service of Northern Ireland; Northern Ireland Fire and Rescue Service; Northern Ireland Ambulance Service; Ministry of Defence (including Royal Airforce); Stena Line; Survitec Group; Irish Coastguard; North Down and Ards Borough Councils; Belfast Harbour."